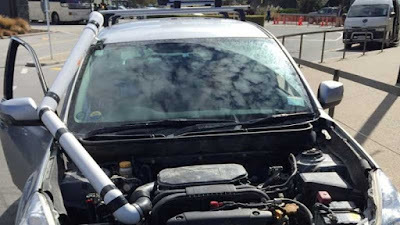 A rental car with homemade modifications, including a "snorkel" made from a drainpipe, has been issued with an infringement notice and ordered off the road by police in New Zealand. The driver was ordered not to drive the vehicle by police at Queenstown Airport on Wednesday. Constable Matt Hargreaves said four men rented the car, took the bonnet off and added a "snorkel", before taking the car on an off-road joyride around the hills of Arrowtown. The men got into trouble when they went to pick up a friend from the airport and were spotted by police, Hargreaves said. The rental company, understood to be Ace Rental Cars, cancelled the men's contract and threatened to take civil action due to the damage done, he said. 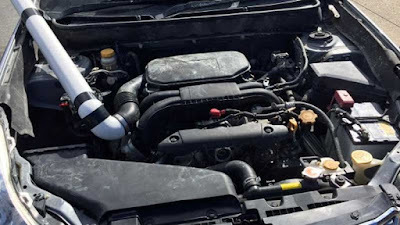 The men, from the North Island, then approached the rental company and bought the car outright to stop any further action, Hargreaves said. He had "no idea" why the men did not just rent an off-road vehicle. "To be honest, I just think they thought it was going to be a bit of a laugh," Hargreaves said. Senior Sergeant Paula Enoka said the men took the vehicle to Macetown, a gold mining ghost town above Arrowtown, accessed by a four-wheel-drive track that crosses the Arrow River and other fords. She suggested next time the men wanted to go off-road, they should "hire a vehicle with a snorkel as opposed to creating your own one".